Four 74" 16 gauge type 304 stainless steel posts. Triangular stainless steel foot plates. Positioned on each end, and also serve as a mid unit. 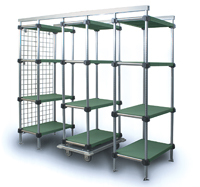 A maximum of three mobile units and 36" aisle space is allowed before a mid stationary unit is necessary. Stationary units must be bolted to the floor. LIFESTOR® Polymer Shelving (sold separately): Smooth polymer shelf surfaces for ease of product removal. Solid or louvered shelves available. Removable shelf mats are dishwasher-safe for sanitation. Makes cleaning easier with safe access to all units and shelf contents. Standard with antimicrobial agent MICROGARD®. LEP74-S 74" post height, stationary unit, master trak® overhead track LIFESTOR® polymer storage system.